Text boxes can be added to a non-fiction book to add aesthetics, they can be used to help with the layout of your information on the page. You can also use the text wrapping option to have your body text flow around your text box. Text boxes are useful for adding sidebar information in a non-fiction book. One word of caution though – don’t overdo it – too many text boxes can make it confusing for your reader. If you’re publishing your book as a PDF ebook, it’s almost certain that you will have links in your book. You may want to include links to your site, for example. These are easy to include in your book. Open your saved Word file, i.e. the file you’ve been using to format your book. Place your pointer where you want the text box. Click the Text box drop down menu. Choose the text box you want to use by clicking on the option. 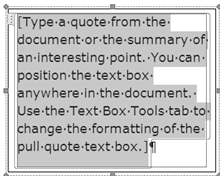 The text box will display on your page, with the default text selected (see below). While the text is selected, you can start typing your text (or you can copy and paste your text into the text box). You can drag the text box to where you want it, by dragging it on the outside solid border. Place your pointer anywhere on the border of the text box; when the cross-hair displays, you can drag the box (see below). You can also use text wrapping on the text box. See the post on Text Wrapping. 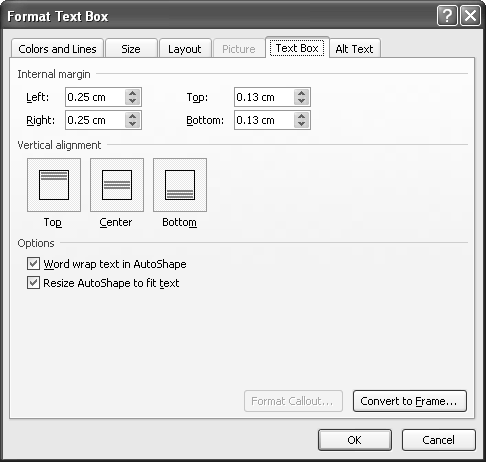 To changes the settings of the text box, with your pointer on the border, right-click and choose Format Text Box (see below). 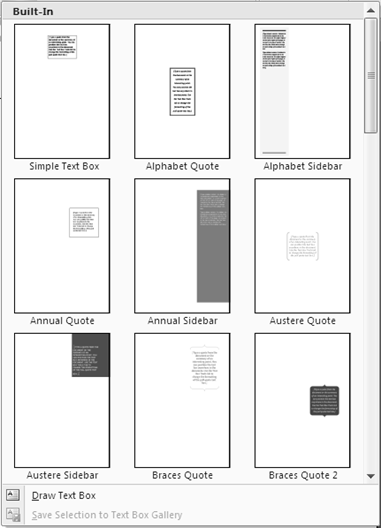 The Format Text Box window will display. Click the Text Box tab if this is not displaying. You can change the distance between the edge of the text and border of the box in the Internal margin frame. You can change the vertical alignment of the text. If you do not want lines around your text box, click the Colors and Lines tab. Here you can change the color or remove the color (no visible border). You can also set a color for the interior of the box, although I don’t advise this as it can be detrimental to the readability of your book. 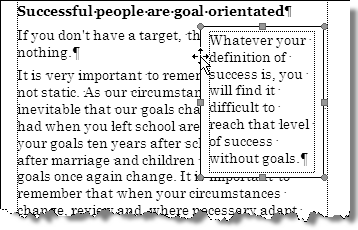 NOTE: If you want to add really special elements to your text boxes, check out this web page (remember, don’t overdo it): Text Boxes and Frames. Select the text that you want to make a link. 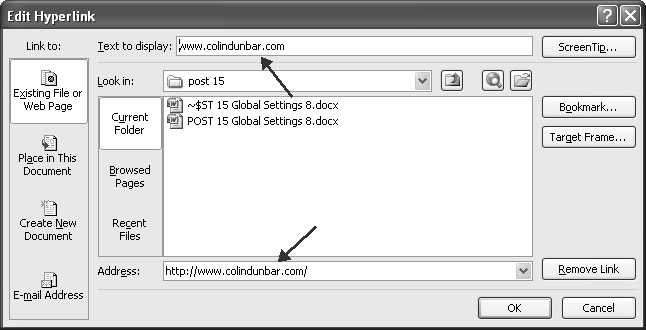 In the Address field (at the bottom) type or paste the URL of the link. Be sure to add the http:// in front of the URL. If you don’t add this, the link won’t function in the PDF document. You will notice that Word adds the http:// to the Text to display field (at the top). If you don’t want the full URL (with the http://) to display in your ebook, delete the http:// in the Text to display field (you can also delete the // at the end of the URL, e.g. the URL, www.colindunbar.com will display. You can check the URL in Word by right-clicking the link, and then choose Open Hyperlink (you do need to be connected to the Internet for the site to open). Cross-references can be useful in an ebook, and they will make your ebook more user friendly. You can also use references in your hard copy print book (but they won’t be clickable :o). The benefit of using cross-references in your file makes it easier if you move text around or change headings, you don’t need to go through your whole manuscript and manually update references. Select the text that you are cross-referencing from, e.g. See Headings (Headings is the selected text). 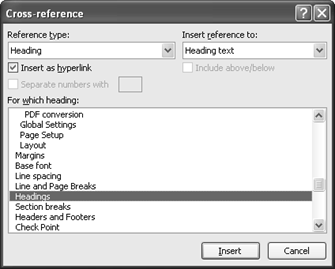 Choose the type from the Reference type drop down menu, e.g. Heading. Leave the Insert as hyperlink checkbox ticked. 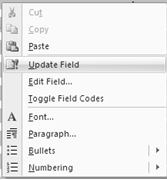 Choose the cross reference name in the For which field, for example, Headings. Usually the Heading text and the Page number options are used, to make it clear for your reader. To make it easier for your reader to identify cross-references, you can change the text of the cross-reference, e.g. change the color and add an underline. To test the cross-reference, hold Ctrl and click the link. This should take you to the part in your book that you have cross-referenced. 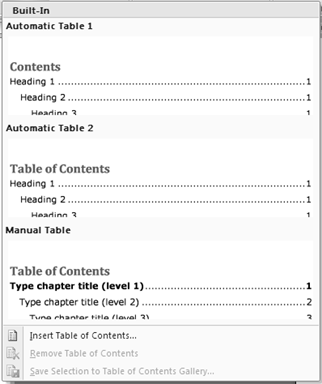 When you have finished formatting your book, it’s time to insert your Table of Contents (ToC). 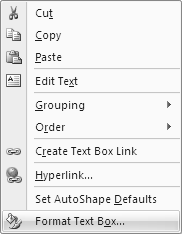 This is done automatically in Word. Click at the top of the page where you want your ToC to be (remember, this is one of your Front Matter pages). Click the Table of Contents drop down menu. Move your pointer down and click the Automatic Table 1 option. The Table of Contents will be inserted on the page. If you add headings, and need to update your ToC, right-click anywhere in the ToC. Choose Update Field on the pop-up menu. Click the Update entire table radio button, and click OK. Your ToC will be updated. You can add a Table of Figures following similar steps. In the next post we will be ending off the formatting of your hard copy book. And then we look at formatting for the Kindle.